1. 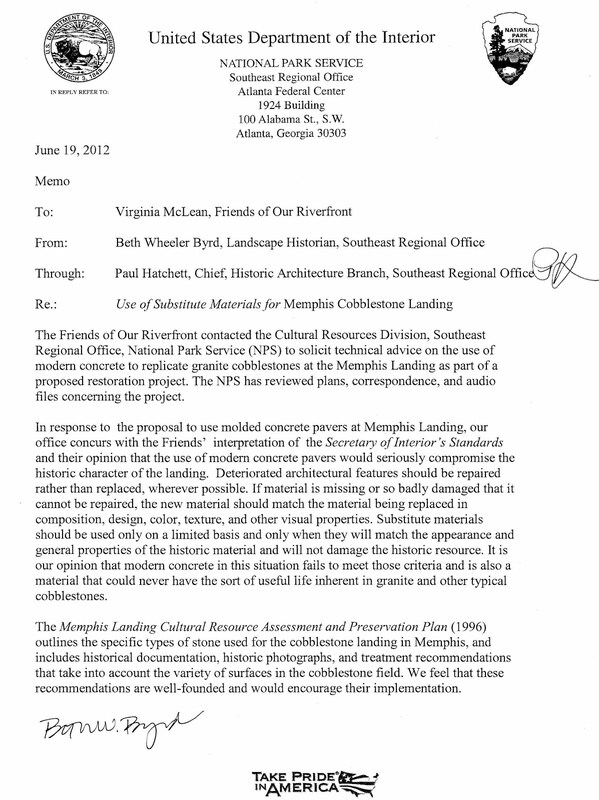 Everybody in Memphis (including the RDC and the Memphis Landmarks Commission staff) says they'd rather use real stone to repair the Cobblestone Landing infill section. That's most of the light gray area in the aerial illustration. 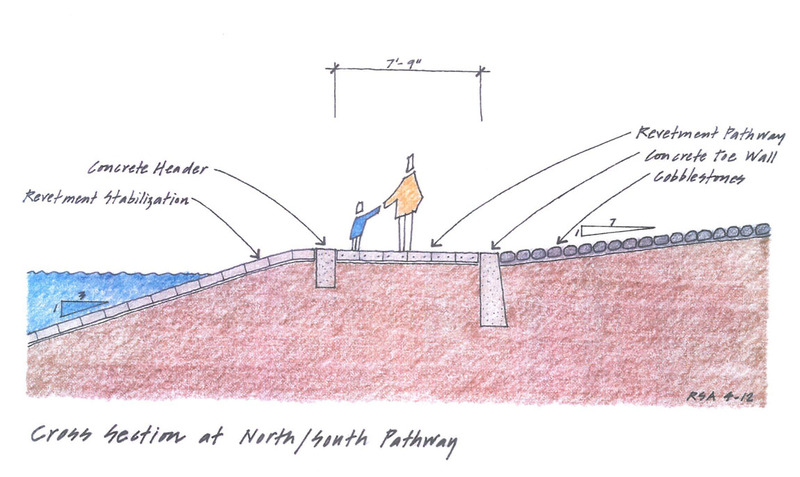 It's marked "cobblestones" in the cross-section illustration. 2. But, according to Landmarks staff and the RDC, somebody in Nashville told us we couldn't use real stone, that it would not meet the historic preservation guidelines. 3. 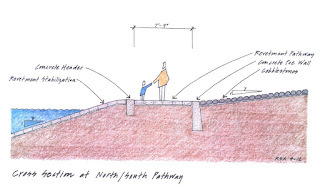 Based on that information, molded concrete pavers were proposed for the infill area, and they were approved by the Memphis Landmarks Commission and the Memphis Downtown Commission Design Review Board. 4. 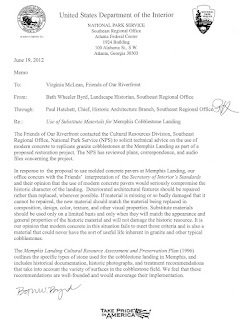 It didn't seem logical that authentic materials wouldn't be preferred, so we checked the Secretary of the Interior's guidelines for restoration and rehabilitation work. Those are the guidelines for historic properties when projects use federal money. Based on the guidelines it sounded like stone was the correct material to use, NOT concrete pavers. 5. But we could've misunderstood the guidelines, so we checked with the experts at the National Park Service. They clarified the guidelines, reviewed information about the Cobblestone Landing, and said that stone should be used. In fact they said that "the use of modern concrete pavers would seriously compromise the historic character of the landing." 6. You'd think it'd be easy to get the situation straightened out, but so far it's still in a jumble. The people in Nashville, instead of considering what's best, are writing about how they don't think concrete will have an adverse effect on the site that they continue to refer to as "eligible" to be listed in the National Register. Just to set the record straight, the Cobblestone Landing is more than eligible. It is currently listed in both the TN and the National Registers of Historic Places, and, if we don't mess it up, it potentially could become a National Historic Landmark like Beale Street, Graceland, Chucalissa, and Sun Studio. The concrete is guaranteed for only 50 years; we know stones last longer. 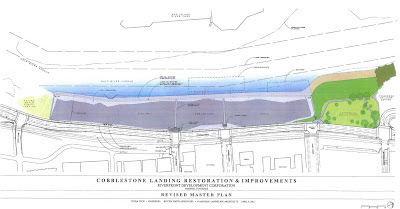 The cost increase to use real stone is $135,000, not a substantial difference on a $6M restoration project.